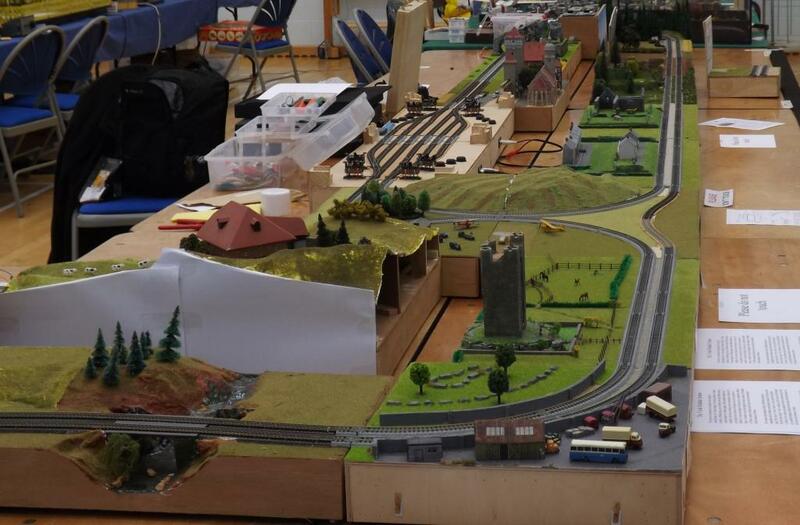 I am attaching a few photos of the layout used to run my Irish stock. The layout is modular and comprises 15 separate modules ranging from singles to triples and includes corner modules. The basic single module is 308mm in length (from left to right), 300mm in width (from front to back) and 70mm in height (from bottom to top). The other modules are multiples of this except for the corner modules which are 365mm square. The fiddle yard (not shown in these photos) is triple in length but about 380 in width, more about this in other posts. Some of the backscenes have been improved and some others have been changed. The photos also some some of the stock that I have. 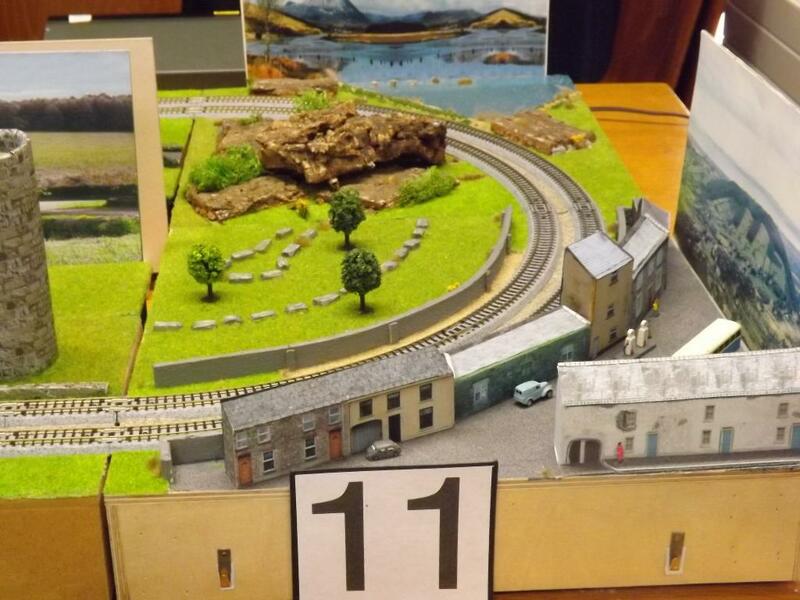 The modules do not represent any particular place or time period but give a flavour of the types of things that can be seen in the Irish country side. The stock is a very eclectic mix because they are a mix of conversions and scratch building from what was available and what was easiest to do. I will post further photos later. Thanks GSR 800. The modules can be alittle fiddly to construct so most are double modules ( 618mm in length) with a few single modules for flexibility. I have fiddleyard comprising 2 triple modules ( each 928mm in length). 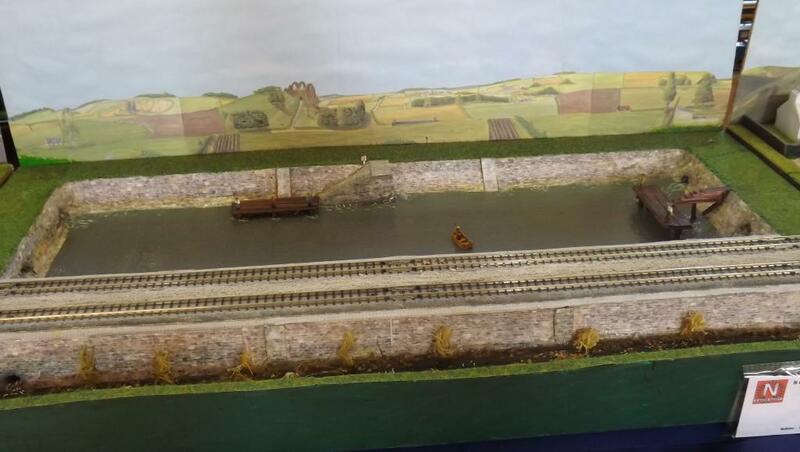 The layout has been expanded and the front and back are now each about 3.2m in length. The 800 is a Farish Royal Scot rebuilt with a few modifications. I am told that the Royal Scot is not quite as big as the 800 but in view of the lack of any better commercial models it will suffice and it does look the part. Fantastic to see - what I am sure is challenging - modeling Irish in N. The furthest I got was buying a shapeways 141 body shell, which I'll get to at some point. Is your 121 a repaint or scratch built? looks good. 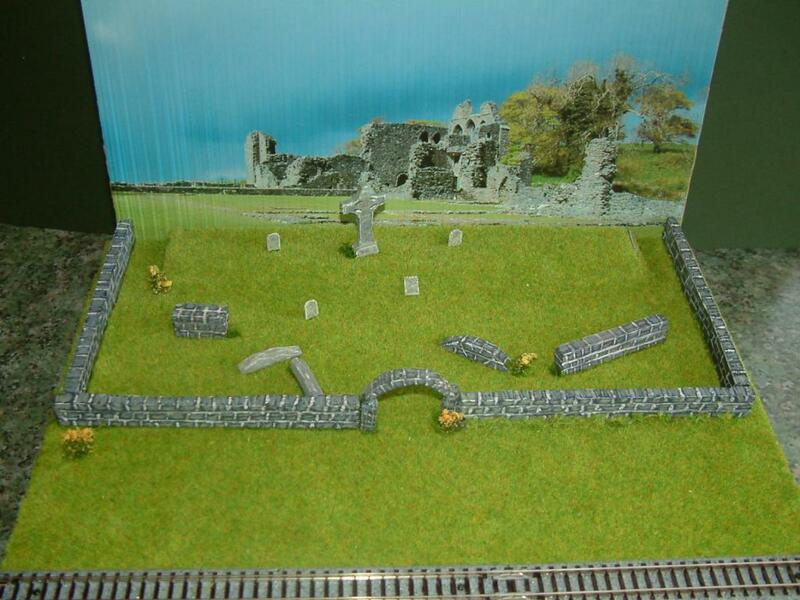 Putting together some kind of Irish N gauge branch line set is on my bucket list for sure. Wow I love this layout more pictures please. Thanks roxyguy. 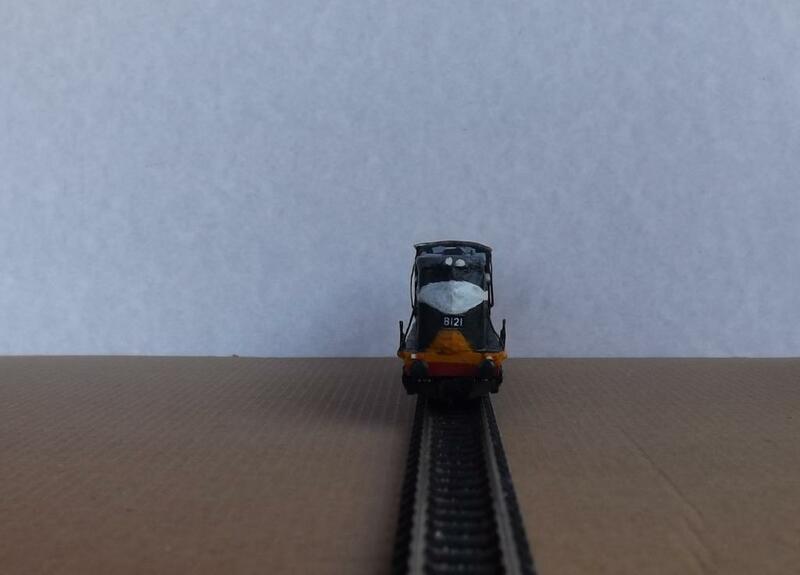 N gauge is a challenge on many levels but as with most things start with some thing simple and gain the necessary confidence to proceed. 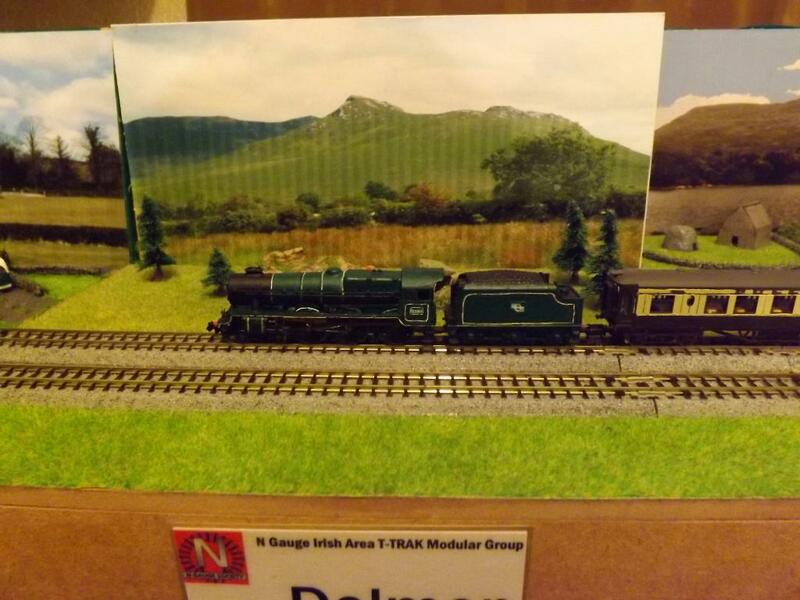 Much of my stock has computer generated sides and ends with card roofs some of which began life as Alaphgraphix OO scale kits that I bought and reduced to N gauge. The three coaches immediately behind the locomotive in the 4th photo in my first post. The 121 is a modified Farish BR Class 20 which was originally in DRS livery of dark blue. I had to modify the cab as it was not the right height or shape and then I had to had a new engine cover again as the original was not the correct shape. The front of the locomotive also had to be remodelled to give it the fight shape and to extend it to come out just over the buffers. In addition I had to make a minor addition to the bogie sides as well as adding some other details to make it look right. I have added a couple of close ups to show all the imperfections. 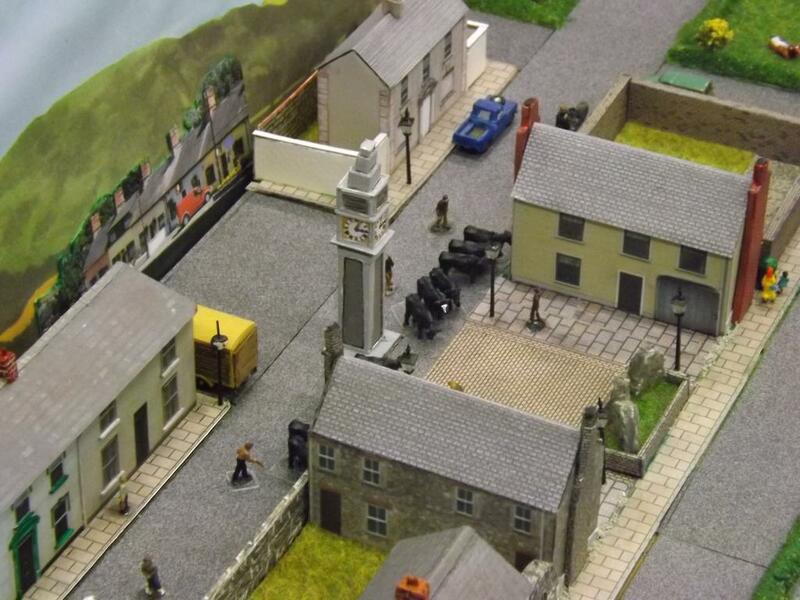 The choice of conversion was inspired by photos of Ballybeg on this forum. I had initially thought of making a 141 but when I saw the black and tan version of the 121 I knew that was something I could do. A few more photos showing a UTA SG3 with different rolling stock and a details from some of the modules. Your layout is well detailed. Even petrol pumps in the village! Could you post more pics of 800 and the Jeep? The village is temporary as it ends up in different locations as do the petrol pumps but I try to create what I have seen in real life or in books etc. I have attached some more photos of the 800 and the jeep. There are not too many of these. I will need to take more in different settings. Hopefully I will get a chance at the 1st Bangor show this weekend. I have included some photos showing the conversions of each. Thanks for the pics;) Forgive me for asking but I know little about module layouts. If you wanted could you make your layout bigger with more modules? 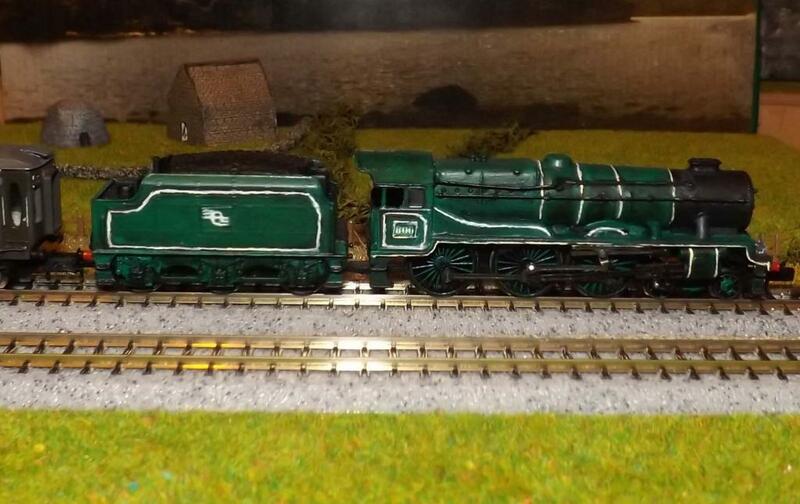 The locos look very good as well as the rolling stock,You seem to have plenty! Thanks MikeO for sharing the photos. GSR800: Yes, you can make it as big as you have space for. 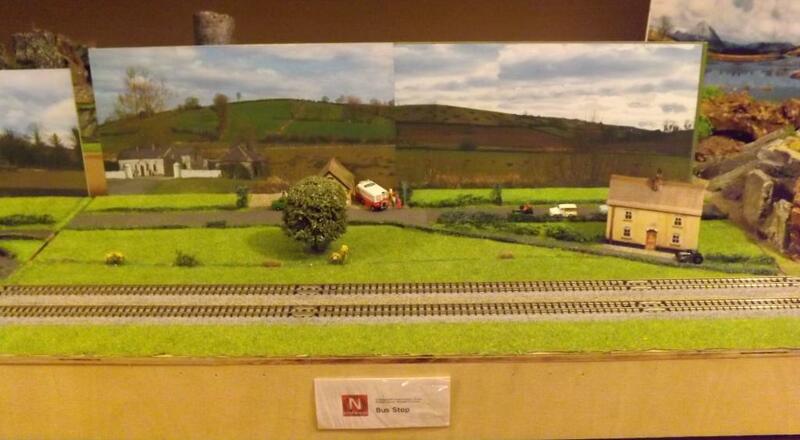 The North Down show in Bangor allowed us to set up a really big layout with a length of 30 foot. Modules came from many individuals and clubs. GSR 800 as Sven - E said we had a very large "L" shaped layout I have attached two photos to give you an idea of the size. 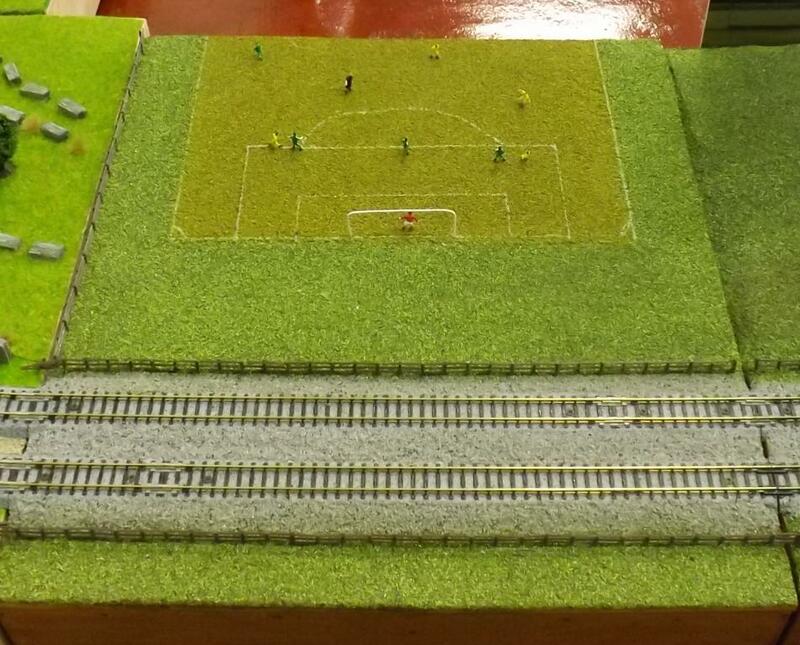 In the first photo the layout, visible in the background, on the green baseboard is not part of the T-Trak layout. I do have a large collection of stock which just keeps growing. Over time I will post photos of the rest. Leading on from my previous post I have included some photos of my stock taken at the 1st Bangor show on 22nd and 23rd of May. I have selected a range of photos to show several different locomotives and coaches/wagons. 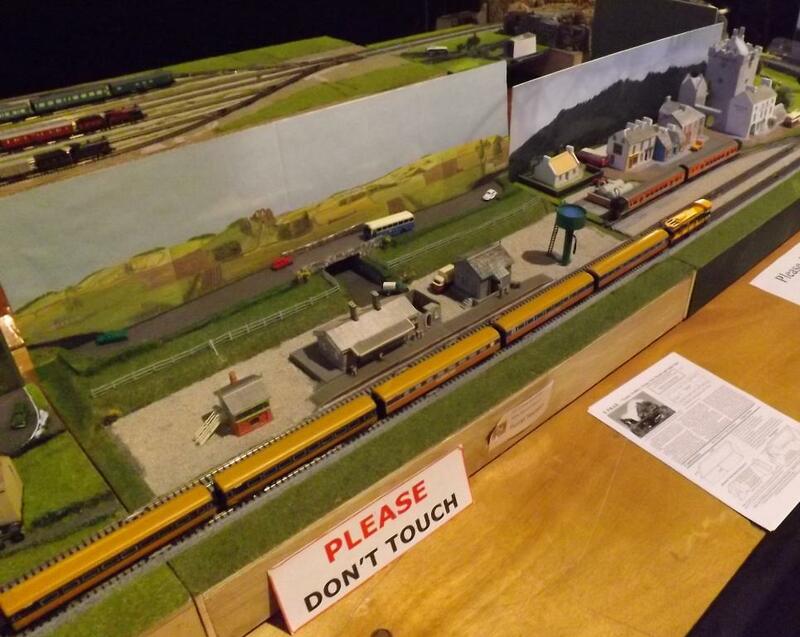 the T-Trak modules tend to be used mostly at exhibitions with the addition of the fiddleyard, which can be seen in the last photo in the above post, I am able to run a varied set of trains each way and rotate them often. This ensures that the locomotives are not overworked and can give the visitors a different experience. First is J8 No. 443 which has the enclosed double cab windows; the only loco of its class to do so. 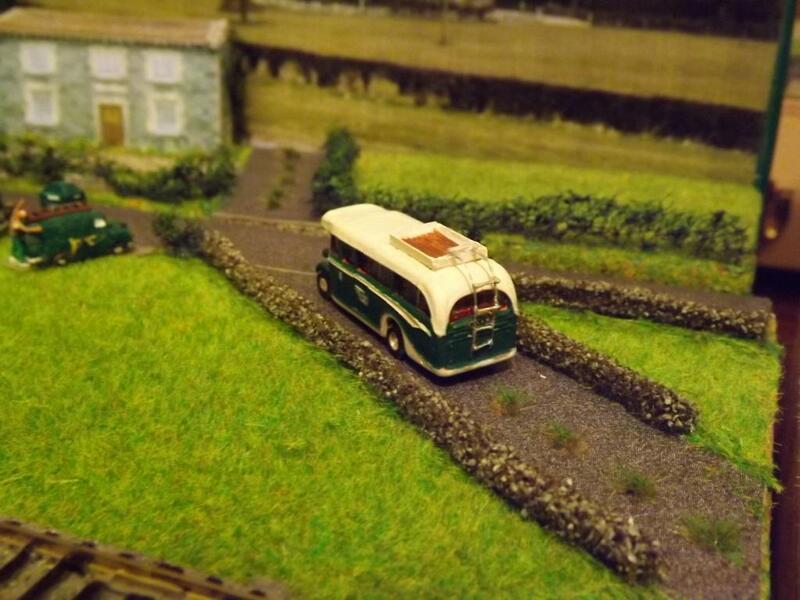 The coaches are scaled down Alphagraphix 00 kits. the leading coach is coupe comp. GNR butter van, the body is scratch built, the drawing I used states that the wagon was painted white; I have guessed that the lettering is red but that could be wrong. The final photo in this selection is an NCC U2 class. 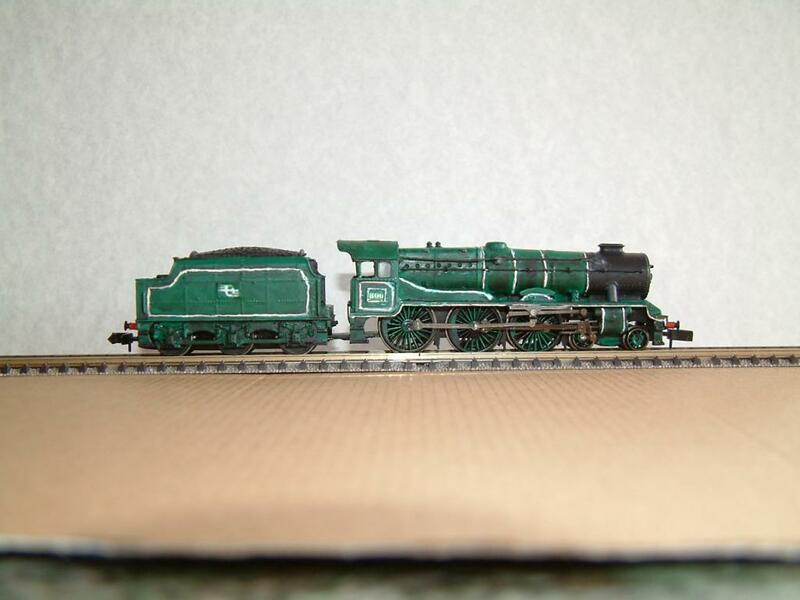 This was the first loco that I converted. 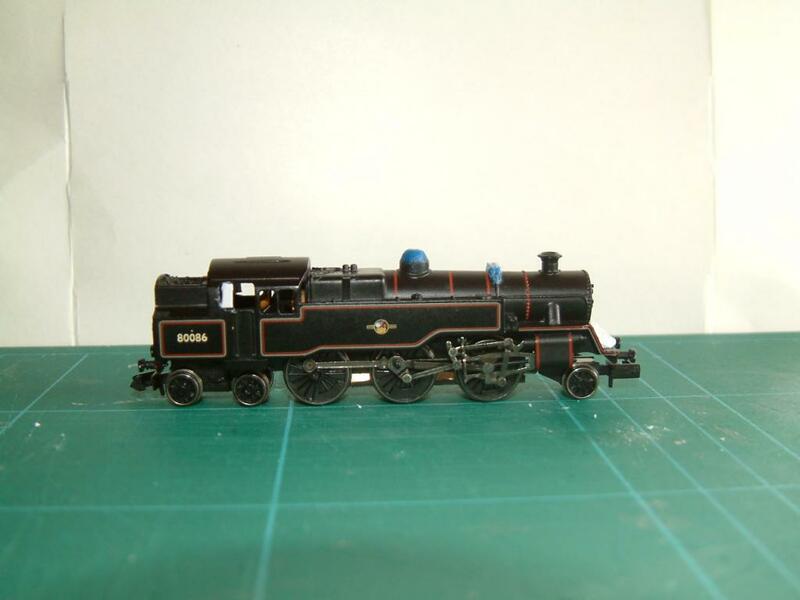 It was a Union Mills 2P in LMS Black. I painted it in the livery shown on the back dust cover to William Scott's on on LMS locos and their predecessors. The version in Cultra is a brighter shade of red/brown. I will post some more photos another time. 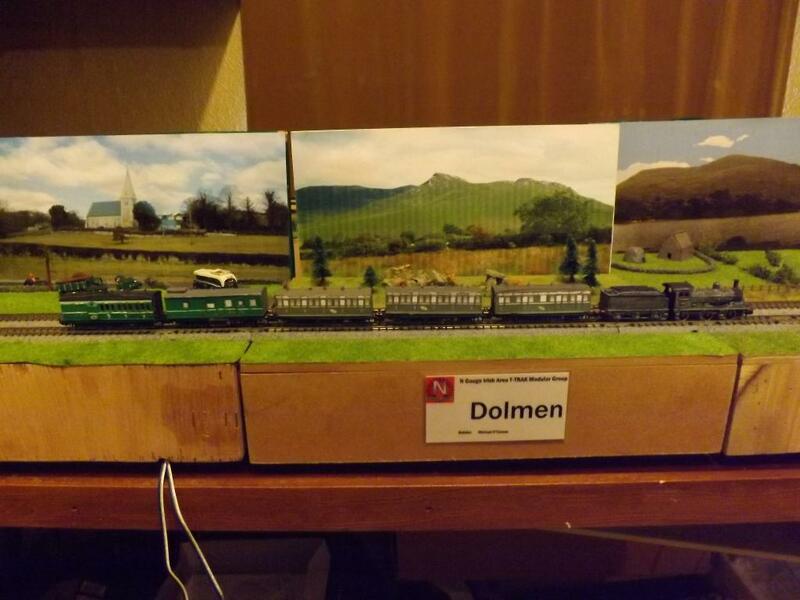 I have a few more photos to showing some different modules, not mine, and also some more Irish rolling stock again not all mine. 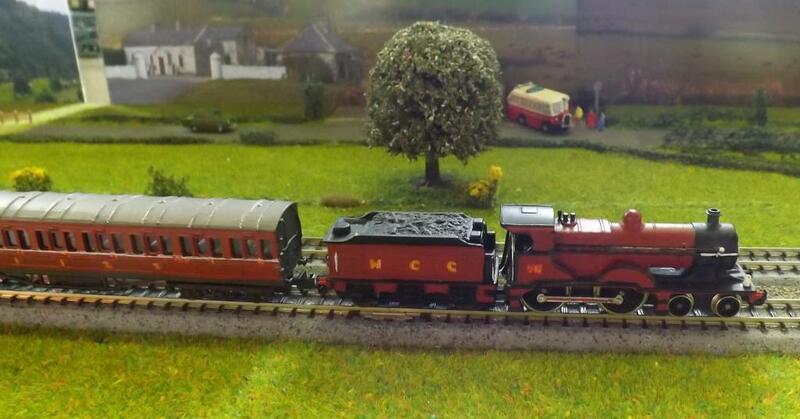 A GNR V class with a short goods train with bogie, 6-wheel and 4-wheel wagons. In the back ground people are boarding the bus. A depot scene on a corner module. 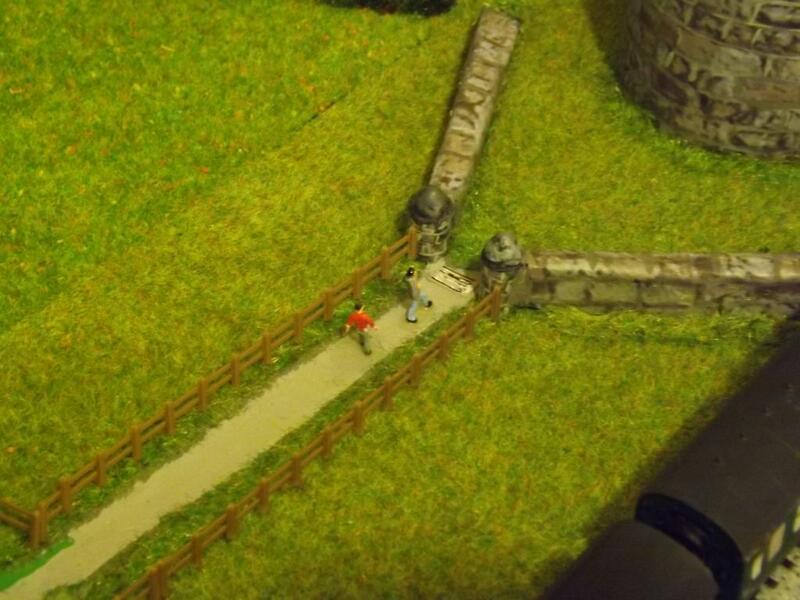 This replaced the village scene on the same corner module shown on an earlier post. That's some collection. Love all the different scenes, the golf course being my favourite. 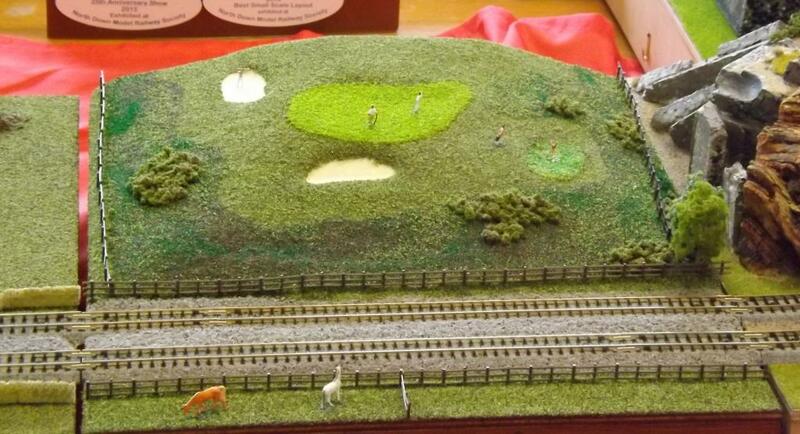 The golf course is very unique idea and well modelled. The collection is still growing. 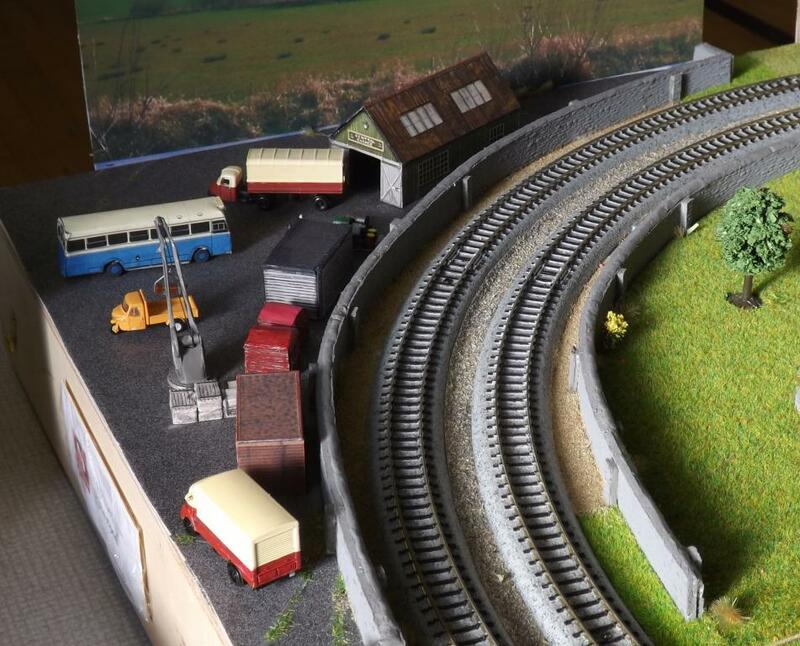 A few more photos of the T-Trak layout. The first set relate to my "Bus Stop" module and the second set includes part of a corner module named the "Gorge" which at present is connected to the "Bus Stop" module. The "Gorge" was inspired by a photo of a goods train of mostly covered wagons pulled by a WT Class loco coming to the summit of line line north of Dundalk. This is a general view of the "Bus stop" module. Next is the Bus stop, the Bus is made from balsa wood and is very rough. 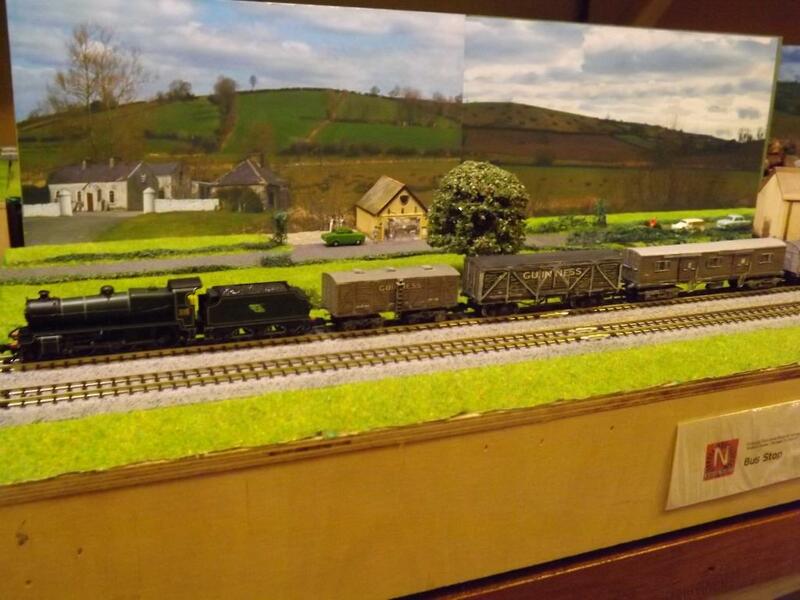 This photo shows the comparative sizes of my Guinness wagon, which is based on an old NE bogie box wagon, so may not be the right size for this type of wagon. 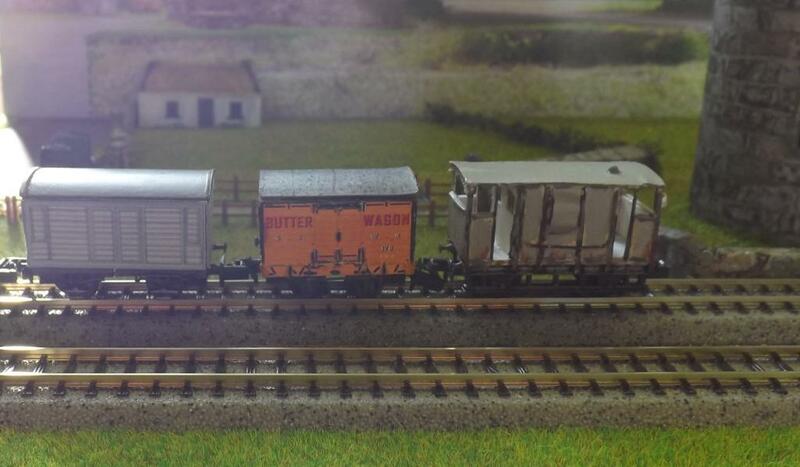 The grain wagon is scratch built and is based on a GNR drawing. The drawing shows the wagon to be 27.6ft long. The third wagon is a GNR 20 Ton parcel van which featured in another thread. 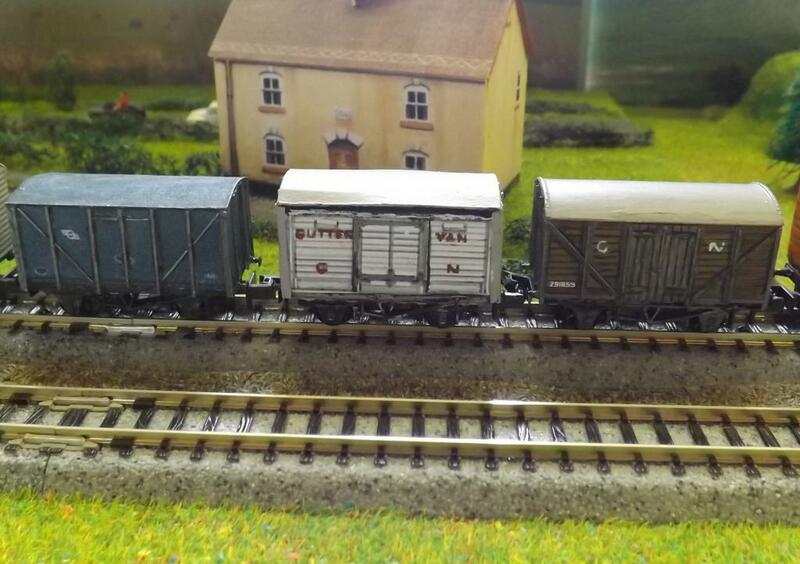 Bringing up the rear of this short train are 2 Alphagraphix Kits, an SLNCR 5 Ton van and a CIE 12 Ton van. These have both been reduced to N Gauge size from the original OO gauge Kits that I bought last year at the MRSI Show in Dublin. 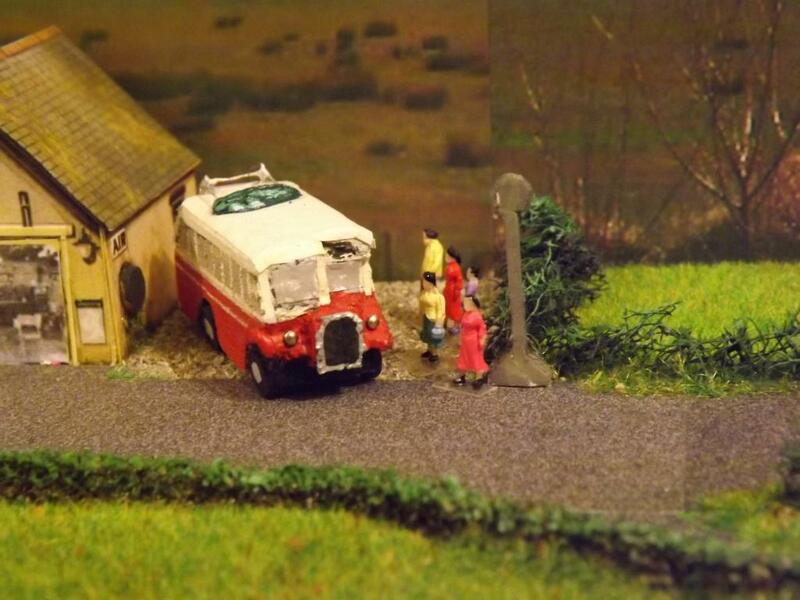 The last wagon is a GNR Y8 refrigerated van, which featured in another thread. I really like this idea. Super to look at. 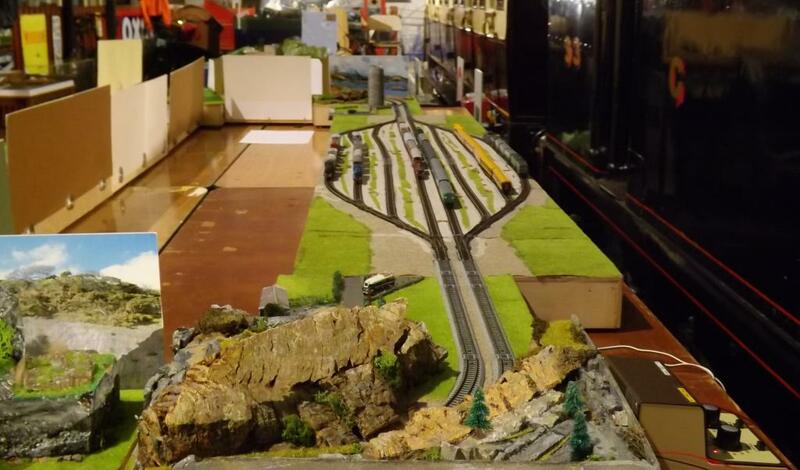 The concept is good and while much of the scenery is permanent like all other layouts, I have chosen to have some parts that are variable . This includes all of the people and road vehicles as well as some buildings or other infrastructure.some of my later posts will show details of such variations. In addition some scenery is variable because I needed to make 3 modules deeper (from front to back) to fit in with the others. After I made my first 3 modules the depth changed from 200mm to 300mm and whilst for home use I could live with the differences, at exhibitions it looked out of place particularly with the backscenes added. 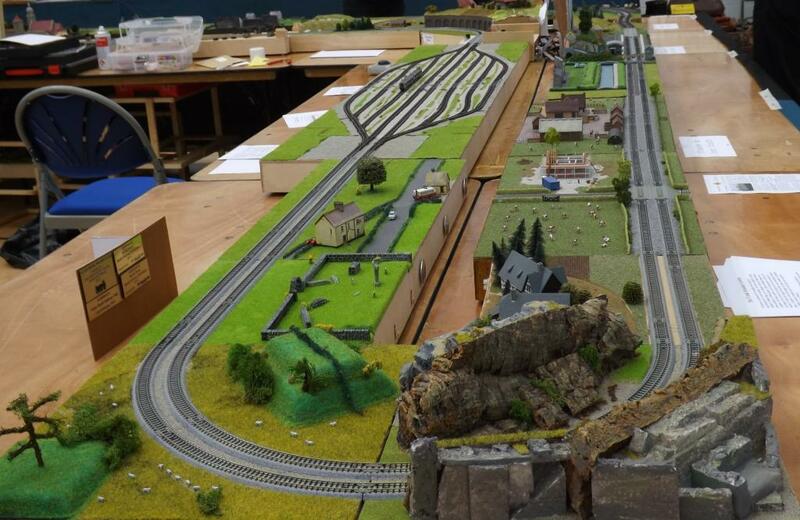 Following the UMRC Show in Carrickfergus last weekend, I am posting some photos of the T-Trak layout. 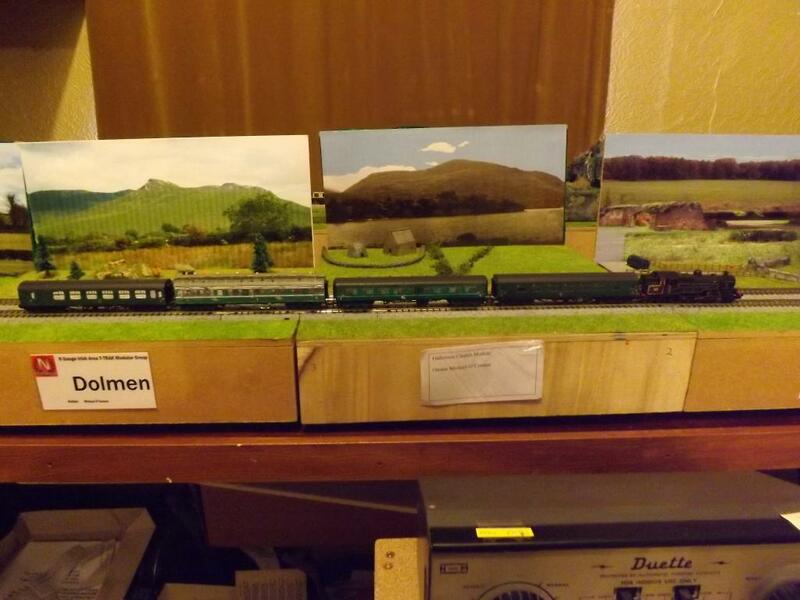 The front and left corner modules belong to Craig Smart of the Midland Model Railway Club while the right corner and rear modules are mine. 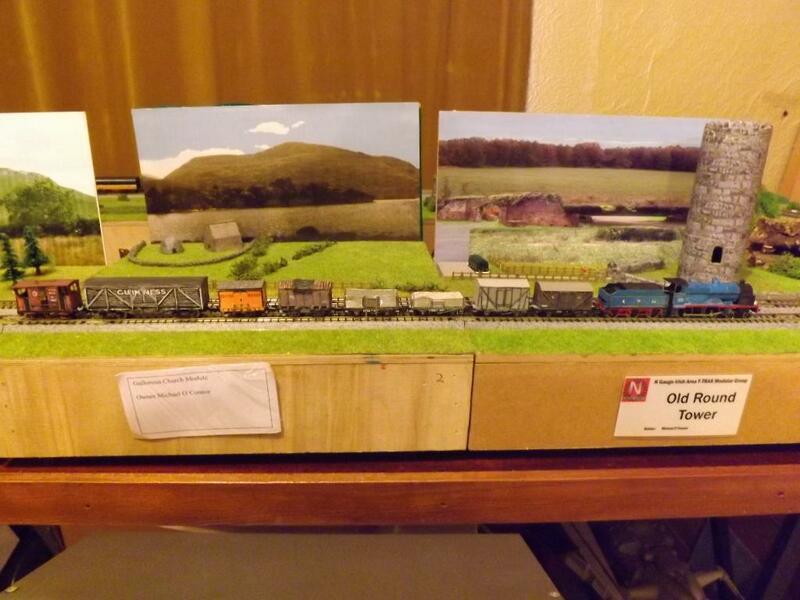 Craig's modules follow a rural theme with the mountains on the left and in the middle an extended farm scene while on the right is a single module depicting golf scene. on the fiddleyard can be seen some of the various stock that ran at different times over the two days. Some German stock was also run. The first thre show an overview of the layout. The next set feature some of the rolling stock than ran on the day. Ranks wagons my versions. 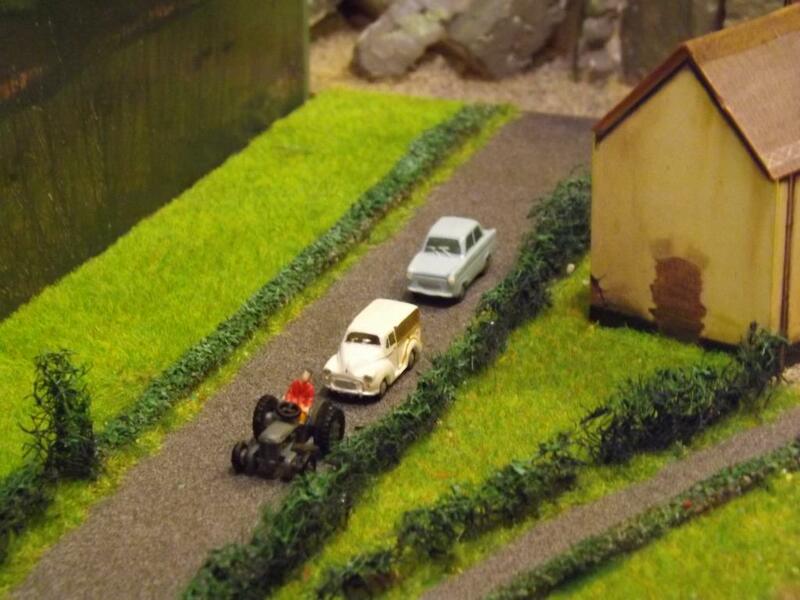 Also included is a fordson tractor on an open wagon. 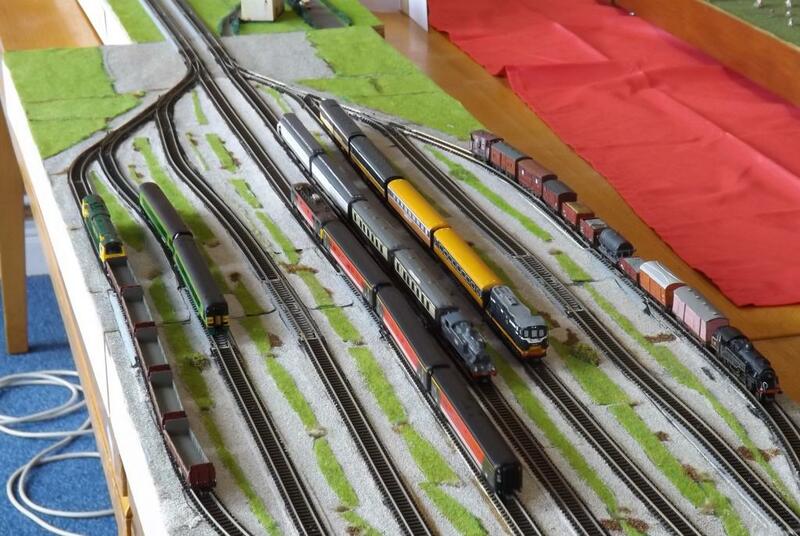 A number of new modules were included in the layout. 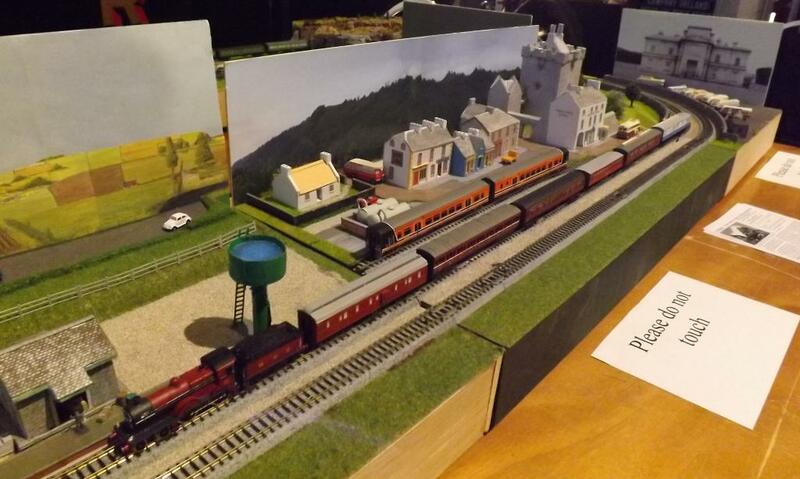 The modules depicted the start of a fair day in a local village, a rural style station and a village with shops, hotel and castle. 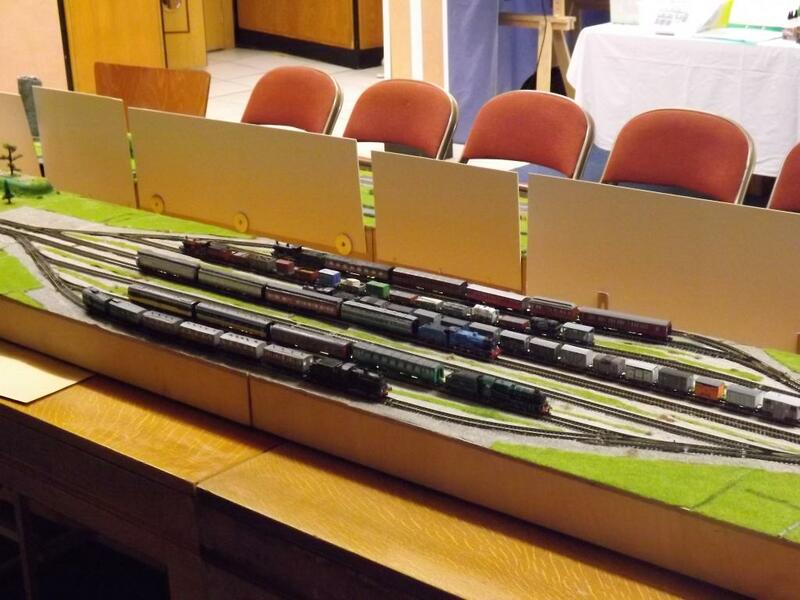 Great to see your layout yesterday Mike with such a variety of Irish rolling stock, I'm just amazed how you can work in such a small scale. It has its compensations as many small details can be omitted unless they are essential for getting the right look. ....and you can cram so much more of the Irish landscape into the available space as well. 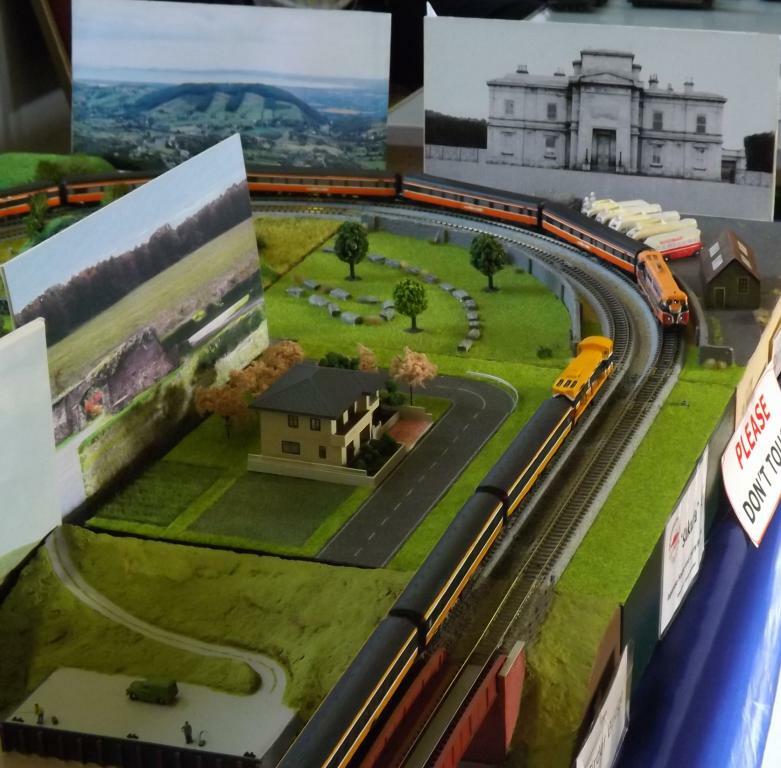 The modular system allows for a great variety of scenery in a small space ( 3.6m or 12ft in length)and can be arranged differently to change to look of the layout so that it is not exactly the same each time it is exhibited. I have been meaning to post some photos of modules and projects I completed over the last 12 months. 1 Fair Day just as people are beginning to gather for the start of the fair. 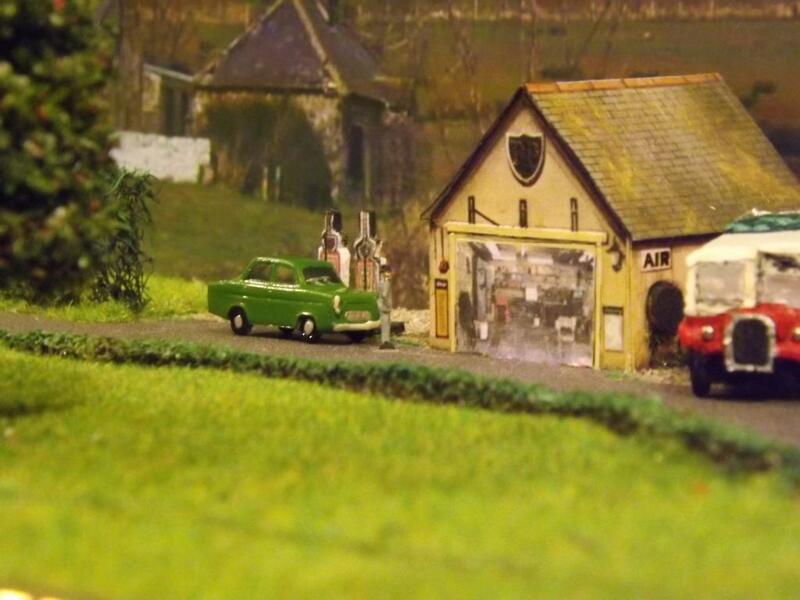 4 This depicts a small rural post office, the stone building on the right. 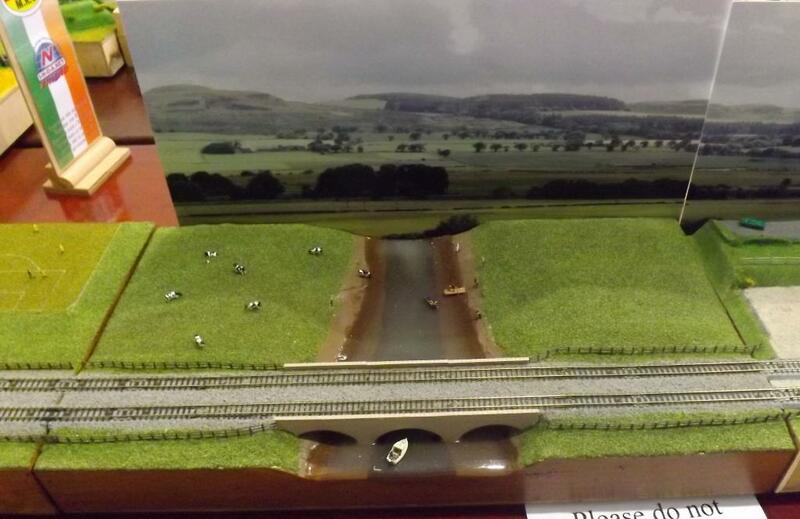 It is modelled after one near Castleblaney. 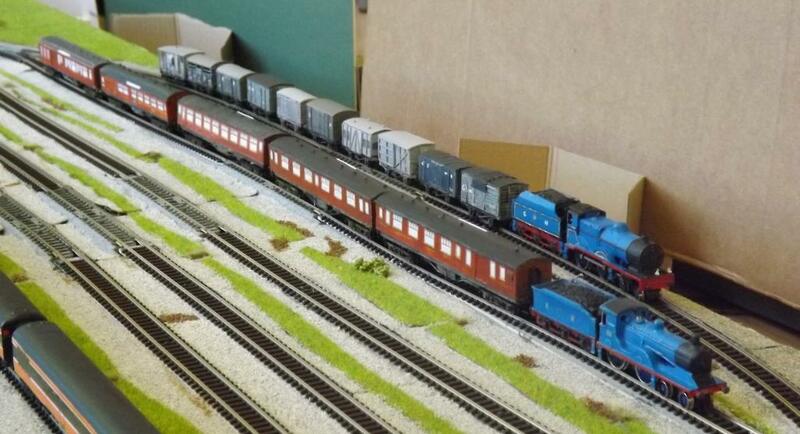 The next set of photos show some of the Locos, coaches and wagons completed. 1 Two class 2700 DMUs one in Arrows Livery using Electrographic vynl sides and one in Commuter livery- hand painted. The latter was done first. 2 A class 2700 in Arrows livery and a class 121 with Arrows liveried coaches. The coaches have Electrographic vynl sides. 4 Irish Cement wagon and Lyons tea wagon. 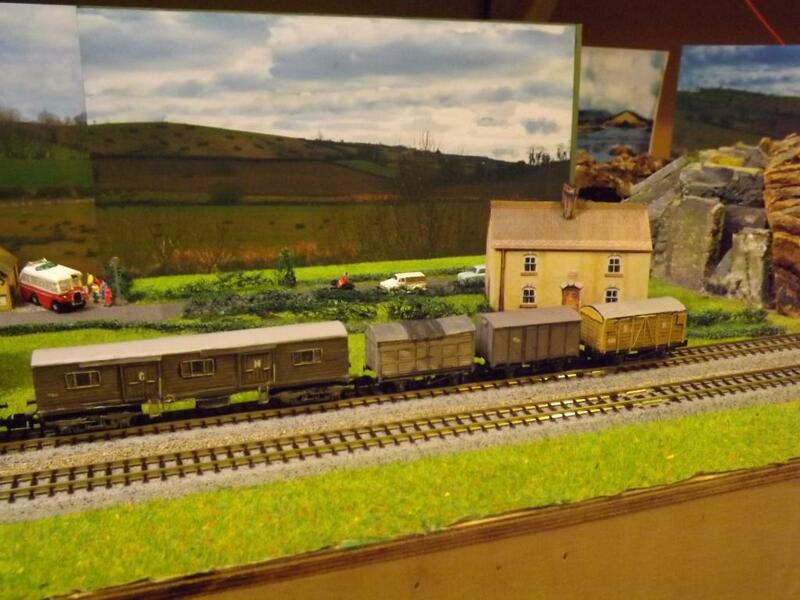 There are a few more wagons and coaches but I do not have any photos to hand. I will post these later. For once, not tempted to ask if it is proper 5'3 (!). Though do wonder what that might be in T? Impressed by what has been done, but a little disappointed that the back scenes do not match. A modular approach clearly works well, but a shame that each back scene is so different from the next one, because it spoils the scenic flow. 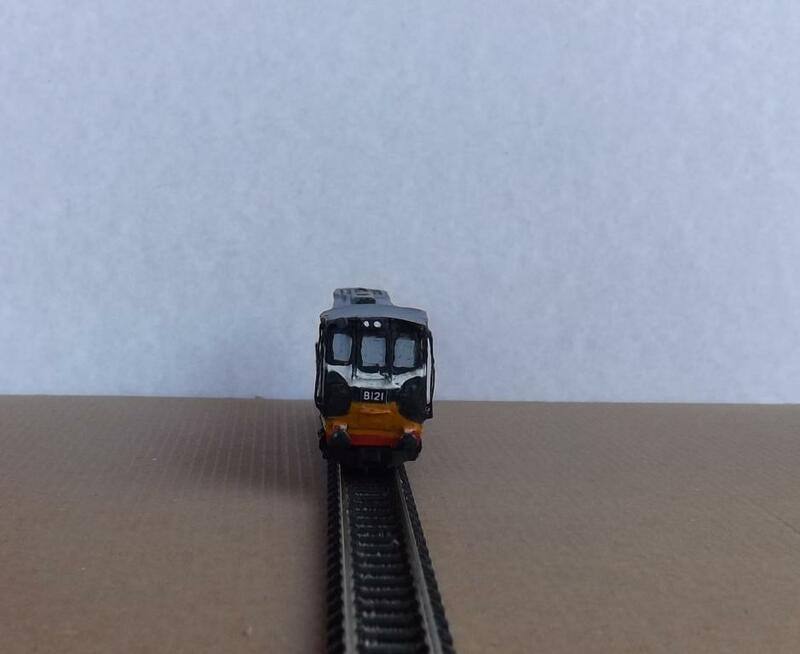 The concept of T -Trak started in Japan for running N gauge trams using Kato track work. 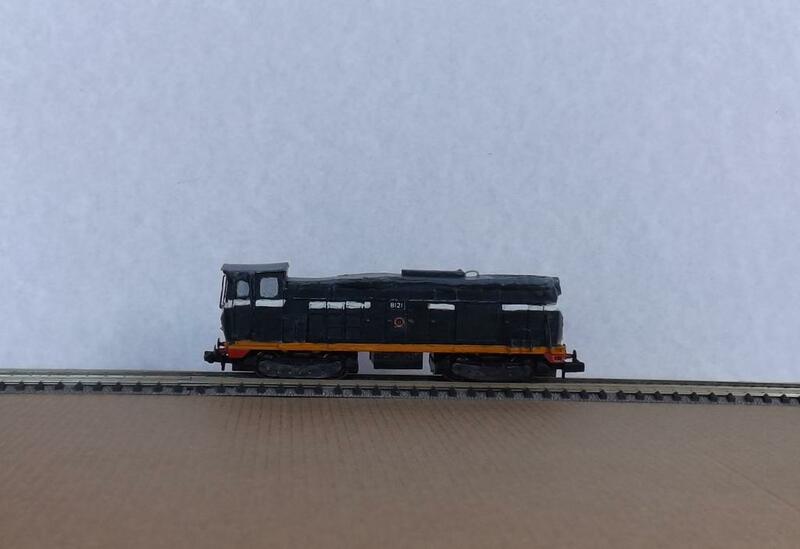 It was picked up in the US and Australia for running N gauge trains. The Australian version has been adopted in Ireland. While the modules can be themed and grouped together to form a homogeneous scene, they are primarily intended to expressions of different peoples skills and ideas and to be part of a larger whole. As such they are not to be part of any flow, consequently with the possible exception of some specialised modules, few are likely to appear next to each other when they are included in a layout. The fact that a module can be anything you want is one of the major attractions of the system, allowing many people to contribute to a layout and in theory for the layout to be any size you want. Having a flowing scenic background, unless a plain sky was used, I think would be difficult, particularly, where the modules are moved around each time they are included in a layout. In respect of my own modules I tried to provide a background scene that would be in harmony with the module. I thought that this approach would be best suited to the varied nature of the scenes portrayed in my modules. Most of my background scenes have been put together using my own phographs but some are just generic off the shelf scenes that have been modified to tie in with the module. These latter and some of my photographic scenes will be replaced with more appropriate ones. Interesting, Mike. Individually, each module looks great and that cannot be easy in this tiny scale, but to my eye, the different back scenes/styles clash. Equally, within the parameters you have set, it is hard to see what else could be done, unless you separate each scene with a 'blank' section to keep each bit physically separate from its neighbour. One of the great things about our hobby is that it offers pretty much whatever each person choses, so all power to your elbow. It is splendid to see some real individuality and anything that does not just come straight out of a box is certainly worthy in my book. The oNe Trak movement http://mrns.homestead.com/One_Trak.html is an attempt at something more realistic than can be achieved with standard N Track modules and tend to be layouts built on modular principals rather than a group of modules joined together for an exhibition or meet. Thanks for the link. The photos are excellent, showing how well T-trak can look. While in theory there are a lot of modules in Ireland getting people to bring them to an exhibition is very difficult. 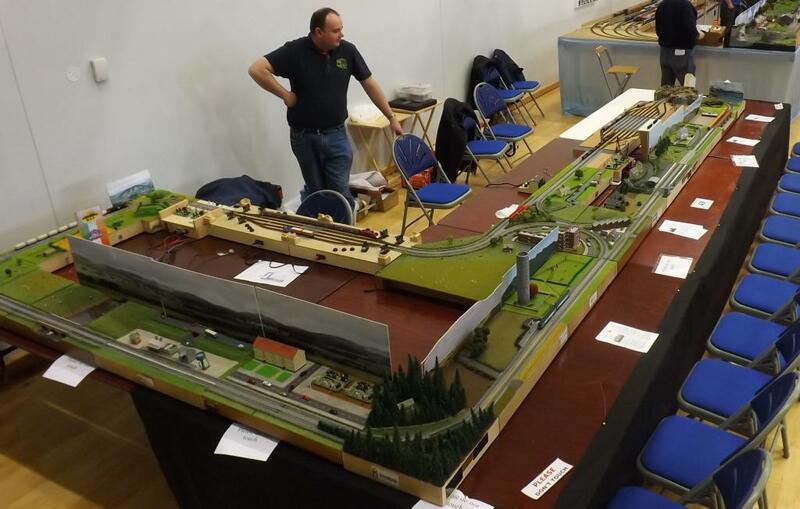 There are a few people I have been able to team up with at shows over the last couple of years and together we have managed to put on a very varied layout. Not however as big as some in Australia as shown in your link. We have difficulty getting space so are usually allocated around 5.4m (18ft) to 6.6m(22ft). 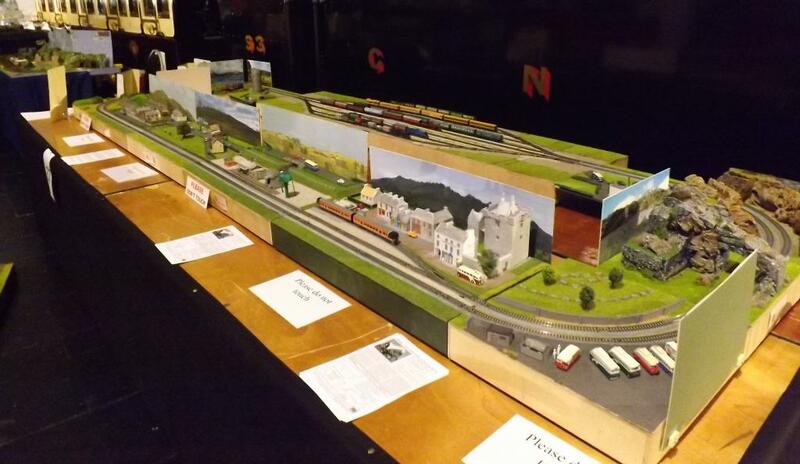 A few photos of the T-Trak layout from the North Down Show at the weekend. It was a busy weekend and I did not get a chance to take many photos even of the T-Trak layout. 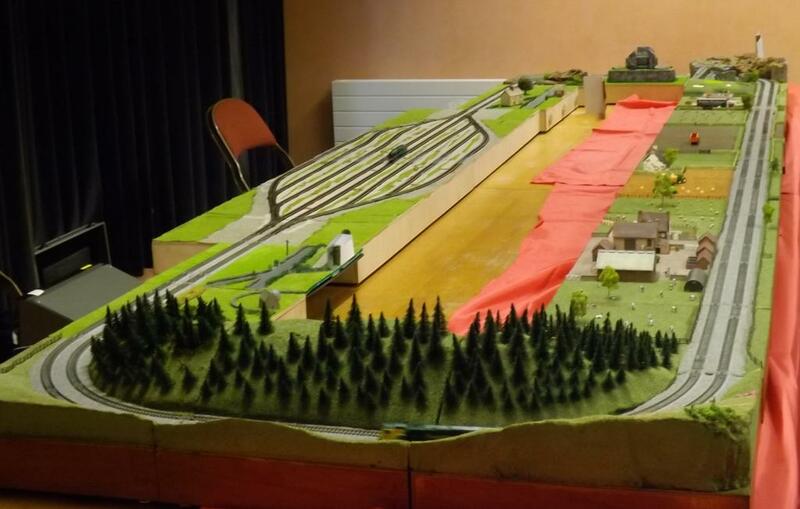 For this year we had input from 4 people including myself which resulted in a very international representation of scenes and trains. Despite my comment to Mayner above I did mange to get some modules from others and will hopefully have a few more from the Show at the end of May in Bangor. Some of the photos had to be cropped due to the file size permitted by the forum. An Arrows liveried class 2700 DMU at halt in one of the stations. 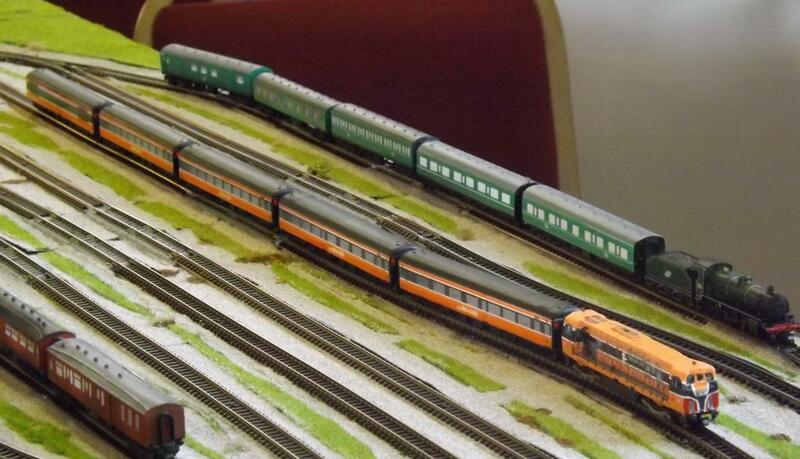 This photo shows some of the international flavour of the trains. Last photo shows a continuous backscene is used for all modules. This gives a more homogeneous feel which was raised earlier in the thread by David Holman. As can be seen from the overview photo this approach was only sustainable for a small number of modules as a number of others had their own backscenes permanently attached. Also in this photo the module on the right is a one of four modules that contained a total of 8 superblocks built from MERG kits. Thes enabled us to run 4 trains simultaneously on the other track and to have each stop at the station. Nice one, Mike, the backscene successfully ties the individual scenes together. Thanks unfortunately the backscenes are not mine. They were only there for the 2 days of the exhibition along with many of the modules. They did inspire me to look again at my own backscenes and while I have decided to keep the scenes, I have made some changes and have had some of the larger on commercially printed. I think they look better and I am putting them on new boards that span the full width of the module. 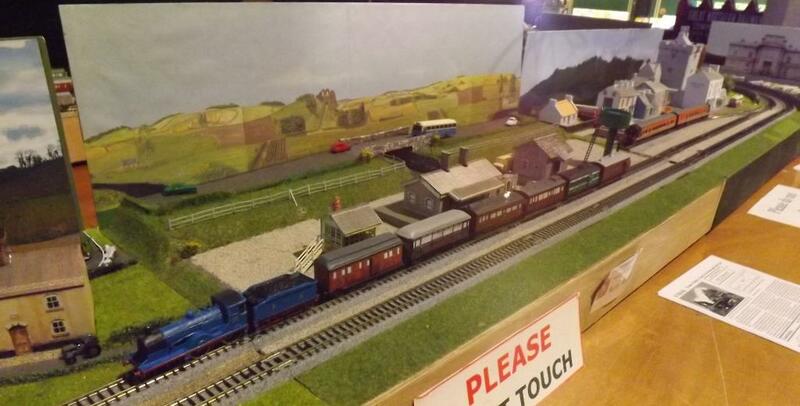 I had a small layout at the show in Bangor on Friday and Saturday last. It was not totally Irish as some Japanese influences crept in. 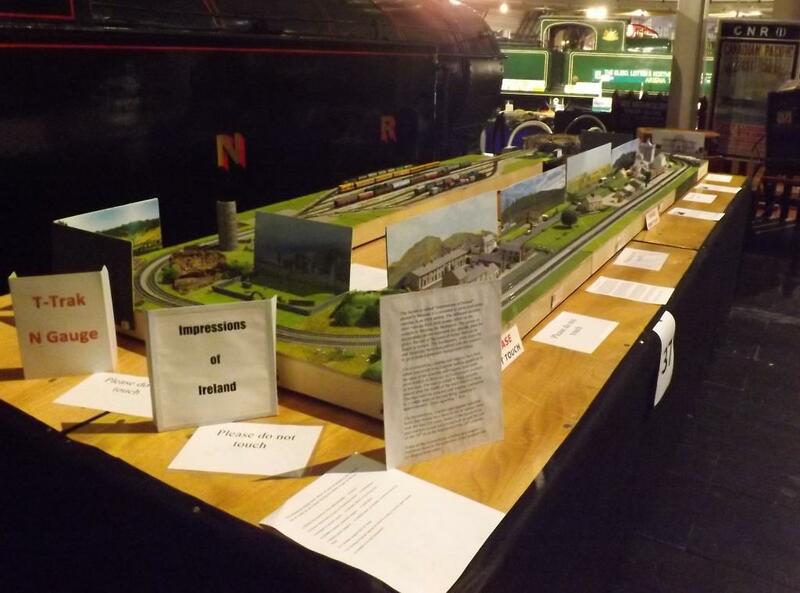 Below are are few photos of some of the trains that were run. The S class in the foreground is running some of the GNR Enterprise stock that I made. These ran circa 1948. 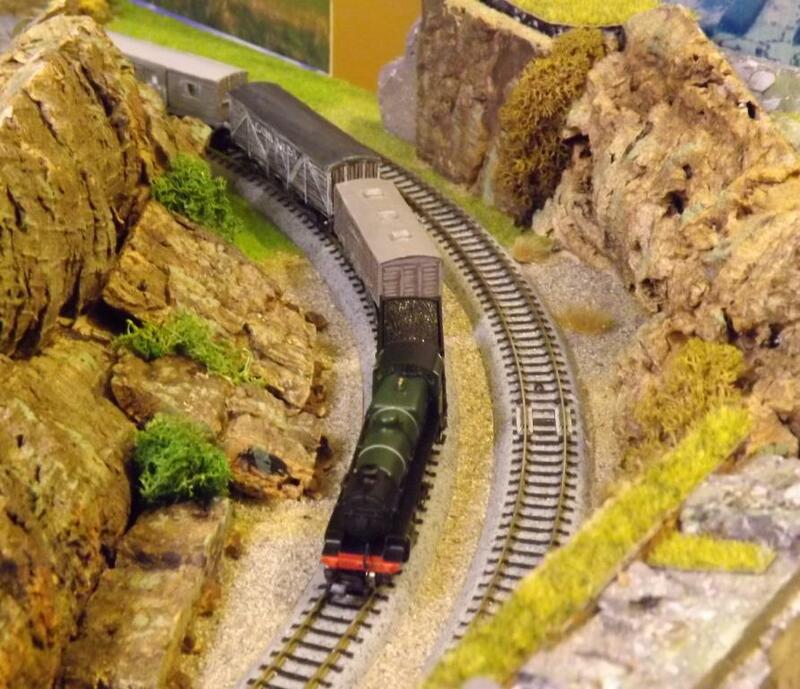 In the background is a GNR V class with freight stock. The class 181 in Arrows livery is a conversion of a Hobbytrain Vissoh G 2000 and the stock are MK 2 coaches with Electrographics sides in Arrows livery. The Mogul(K1) is a Fraish Southern N Class and the stock is a mixture of printed sides on MK 1 coaches or scratch built. 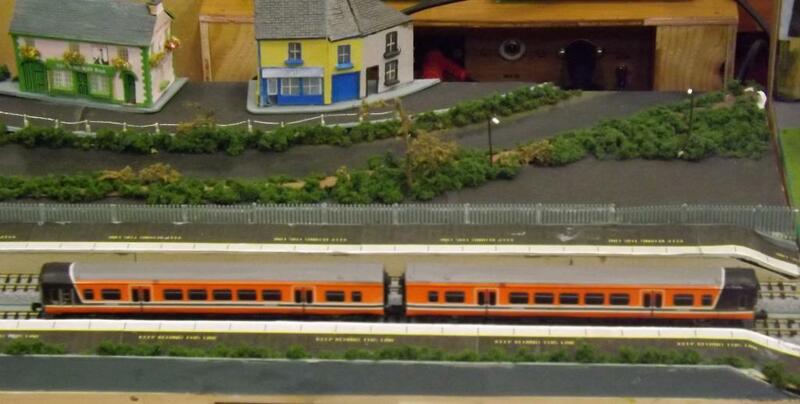 Here we have the Class 181 again and a Class 121 with stock in black and tan livery. 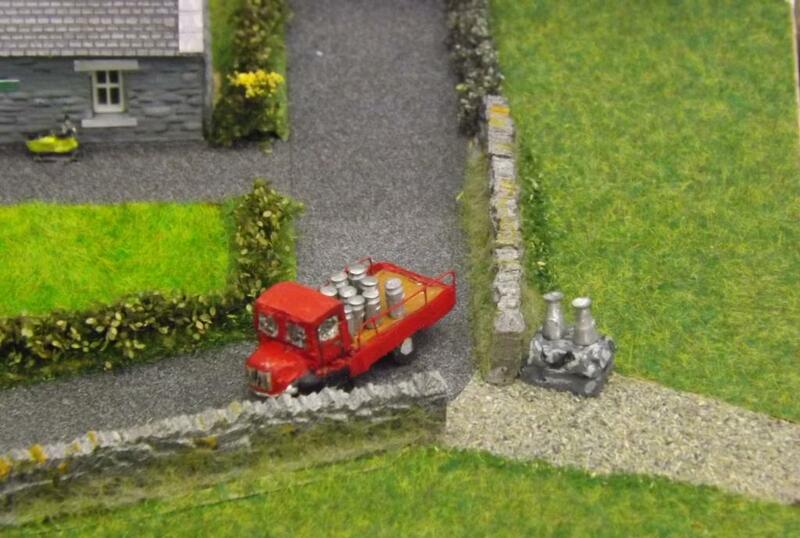 Some scratch built Cement Bubbles and a cement wagon plus a Ranks wagon. The Japanese House crept in partly for variety and partly to help its builder ensure that the module could successfully connect with others. 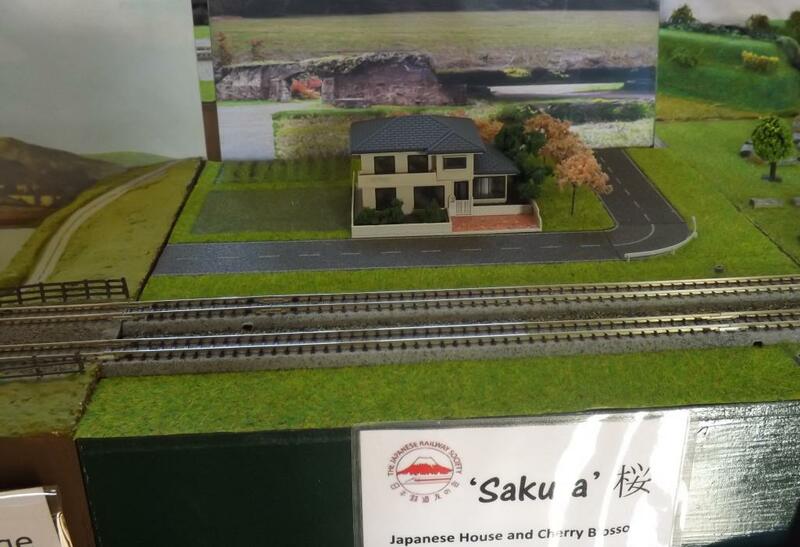 Some Japanese trains also made an appearance from time to time. Another new temporary module for variety is the Pond made by yet another modeller. This uses a different technique for making the water bed but has had around 6 coats of varnish applied. There is a small river in the foreground.